Have you ever bought mushrooms intending to eat them and instead after awhile they go black and slimy in the refrigerator? Once you harvest them, they will not stay fresh for long. Sometimes you don’t have time to run in the store when you need them immediately. But, a perfect solution to this problem is to dehydrate them. You will have a fantastic end product, and it is very easy to dry them. Whatever opinion you have on them, the fact is that they are quickly grown indoors, very versatile and add a lot of nutrition to your meals. Drying mushrooms in the high-quality dehydrator is a perfect way to preserve their abundance. They are amazing in tons of meals, packed with flavor and can be stored for an eternity. When you rehydrate them, you can use them in pasta dishes, risottos, soups or any other delicious recipe that crosses your mind. In this article, we will show you how to dehydrate mushrooms and enjoy this delicious snack with your family. If you want to learn some delicious dried mushrooms recipes we got you covered in our other article. For now, lets learn the process of drying these veggies. Most of them gain flavor, not only retaining it, in the dehydration process. When you want to rehydrate them, they will have almost the same texture as the fresh ones. The best part is that you can store them for one year. 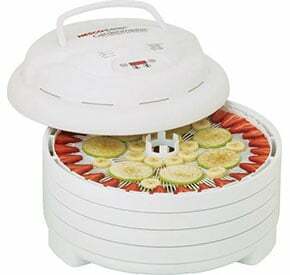 You could also dry them in the oven, but for the best results, you want to use a good-quality dehydrator. It is easier and more convenient process. First, you need to clean them. The best way to do that is to use dry paper or a brush to wipe the dirt off of them. It is wise to avoid cleaning them with water because you want to prevent mold or other fungi to grow on them after you store them or while dehydrating them. Be careful with that, because this mold or other fungi can make you ill if you accidentally eat it. Sometimes there are some spots of dirt that will be hard to brush away, but you can use a paper towel or a damp cloth to scrub it off. Make sure to use them again to wipe the same area if there is any moisture left. If you really need to wash and scrub them with the brush that is fine, because some species have lots of crannies and nooks, but makes sure to dry them properly before you place them in the unit. Use a paper towel or a damp cloth to make sure they are dry enough. It is a good idea to clean them first and then cut them. You know the rule, the ticker you slice them, the longer it takes them to dry in the dehydrator. But, there is a better solution. Just cut them into pieces that are about 1/8 to ¼ inch thick. This choice will inevitably depend on how you want to use them after they are dried. Don’t worry; they will still be a great addition to any meal because they will retain their flavor and it will take less time to prepare them. Brush or rinse clean. Use a towel to pat dry and make sure to remove all the moisture from the mushroom’s surface. Then slice it into pieces that are about 1/8 to ¼ inch thick. As long as you are consistent in your slices, the size doesn’t really matter. But it is important to have equal pieces so that the drying process can be faster. To cut your mushroom even quicker you can use an egg slicer. Place them in the dehydrator on the trays, leaving the space between each slice so it can dry properly. Don’t make more than one layer. Although, they will shrink up don’t let the pieces stack. Set your dehydrator at the one hundred degrees F and leave the mushroom dry overnight. If you want them to be done faster, just set the higher heat. You don’t want them to be spongy, but also not brittle. After they are done and you remove them from the appliance, leave them to cool. Store it in a freezer bag or an airtight container and leave it in a dark and cold place. The best is to use a vacuum sealing or a jar with an oxygen absorber. NOTE: If they are stored correctly, they can last for years. 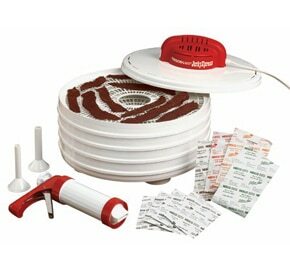 ‘’Maintain stored foods in their original packages whenever possible. Most packaging is designed for the food it contains and will remain in good condition for their given shelf-life in the absence of temperature and humidity abuse. For instance, the cardboard box will help cushion jars and other glass containers from breakage. If original packaging is not practical, maintain the food in airtight containers, primarily to prevent the entry of insect and rodent pests and keep out other contaminants. To take this to another level, consider oxygen as a major threat to the quality of food. The chances are that moisture-proof packaging is also airtight. The less head gas (<2% O2) in a package, the longer its shelf life is maintained.’’ according to Food Safety Magazine. In a heat-proof bowl, place the dried mushroom and pour boiling water over them. Leave them for about half an hour. Use this liquid for sauces and soup stocks, drain the mushrooms and they are ready to be used. Whether you bought mushrooms in the store or you grow your own, they are very easy to dehydrate. It is an excellent way to preserve them for later use in backpacking meals or for long-term storage. They are very easy to rehydrate, nutritious and extremely light food. Use them in pasta, omelets, stews, soups and other dishes you love. Enjoy this delicious snack!